Growing up in the Ottawa Valley was not especially interesting. It was not as adventurous as Toronto. It was not laid back like Vancouver. It was, however, an hour or so from Montréal, the city that boasts bagels, poutine and dépanneurs with beer-stocked fridges. Being young, penniless and car-free, I never got the opportunity to truly appreciate the cosmopolitan Québécois cuisine. After I moved to Toronto and saved a little money, my friends and I decided to take a weekend trip to the city. To say that “we did the city right” would be an understatement, as we overindulged in a lifestyle that was decadent, yet affordable. We stayed up until the bars closed at 4 a.m. — an anomaly for Ontarians — consuming riches of wine and martinis, and eating until our bellies rounded. Since then I have not returned, still suffering from the food coma that ensued. That was five years ago. For me, reading Emma Sloley’s account in The Australian of going “the whole hog” was nostalgic. Although I had not eaten a pig’s hoof stuffed with foie gras or “gooey gratin,” her article still brought back memories of Brazilian beef skewers and all-you-can-eat sushi. It made me remember the grilled paninis avec tomates sechées and poutine piled high with fresh curds and gravy. It reminded me that Montréal’s cuisine was and is dynamic and worldly. Growing up in a border-town of Provence du Québec, I would like to mention that locavore-orientation (a locavore is one that eats food grown near them — usually 100-mile radus) is not a movement in Montréal, but an idea deeply rooted in the province’s identity. To me, dealing locally has been, and hopefully will always be, what makes Québec authentic and genuinely unique. 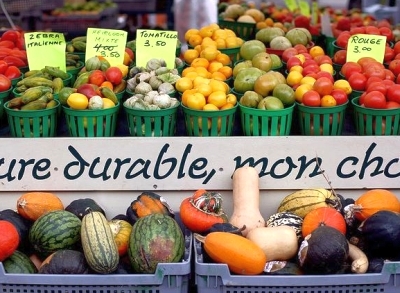 The French-Canadians have supported local farmers from the beginning in an attempt to not be consumed with anglophone tendencies. Although the city dabbles its toes in global luxuries, like diverse food and shops, it always maintains one foot firmly planted at home. Some people chide its reluctance to keep up with the times, but some see its syrup-paced change as a good thing. Personally, if I am still fantasizing of food comas, they must be doing something right.